One of the participants at the 2013 LOI Consultation has returned to Albania to discuss the rights of Christians with the President of the country. 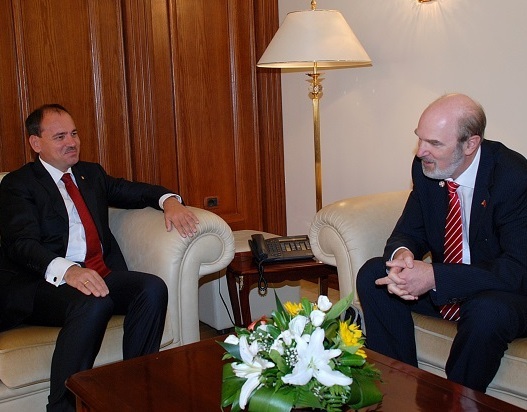 The Ambassador for Human Rights of the World Evangelical Alliance and Director of the International Institute for Religious Freedom, Dr. Thomas Schirrmacher, presented the concerns of Christians in a one-hour meeting with the Muslim President of Albania, Bujar Faik Nishani. Schirrmacher thanked the president and the Albanian government that the relatively new Albanian Evangelical Alliance has been officially recognized by the state. Now is a good time for both church and state to recognize that the once closed churches can be good citizens. Because the Albanian Evangelical Alliance did not exist before 1989, it is not directly involved in the complex and partly discriminatory process of restituting church properties that were nationalized by a previous regime. 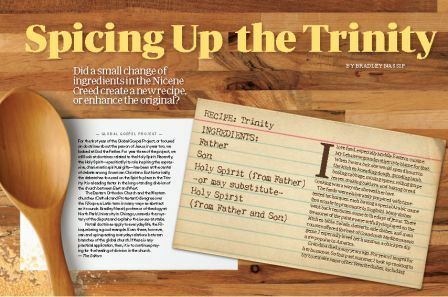 One of the key note speakers from the 2013 Lausanne-Orthodox Initiative Consultation, Dr. Brad Nassif, has an interesting article in the current edition of Christianity Today. He writes about the theological convoversy concerning the Filioque, which has divided the Church for over 1,500 years. Reflecting on his grandmother’s recipe for hummus he suggests that this issue might not be as church-dividing as we think and that the debate about it may in fact enrichen (spice up) each of our different Christian traditions. 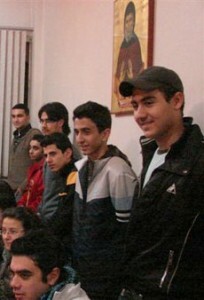 Brad Nassif is professor of Biblical and theological studies at North Park University, Chicago, USA and a member of the Antiochian Orthodox Church. His All-Holiness also made reference to the shared theological dialogue the International Commission for Anglican-Orthodox Theological Dialogue whose drafting committee are coincidentally meeting together in the Anglican Communion Office in London this week. Archbishop Welby has said he hopes the visit will help to develop greater fellowship between the two churches and contribute to the goal of Christian unity. 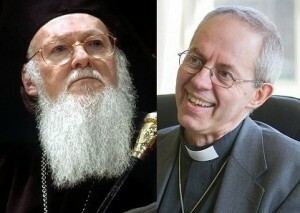 The Archbishop of Canterbury, Justin Welby, will visit His All-Holiness Ecumenical Patriarch Bartholomew in Istanbul today (13 January 2014). Archbishop Justin is from an Evangelical background (having worshipped for several years at Holy Trinity, Brompton, home of the Alpha Course). Responding warmly to Ecumenical Patriarch Bartholomew’s invitation to visit he noted the important contributions His All-Holiness has made to the world Church and to society at large, and recognised all that unites the Anglican Church and the Orthodox Church. The intensive two-day visit will include a private meeting with His All-Holiness, an official reception in the Chamber of the Throne, and a discussion with the Synodical Committee for Inter-Christian Affairs. Archbishop Justin says that he “hopes that the visit will help to develop greater fellowship between the two churches and contribute to the goal of Christian unity”.